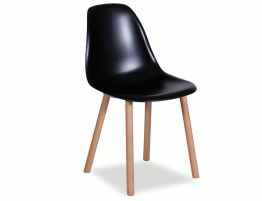 Put this stunning, modern retro black chair in your dining room or as additional seating on a living room. Or put this midcentury modern reimagined dining chair in your kitchen for a sleek, designer look.The Eames retro ‘Eiffel’ chair made its stamp on interior design for half a century with its clean, simple shape sculpted to fit the human form. Now with the addition of a contemporary beechwood base, this chair becomes something altogether new. Our abs plastic moulded chair is strong enough for both residential and commercial use and the naturally finished Beech wood base offers attractive stability. 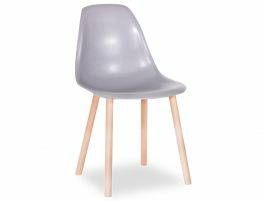 With a perfectly sculpted plastic shell seat, our retro Canndale dining chair makes a perfect kitchen dining chair and side chair. 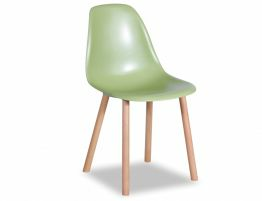 Relax House furniture proudly offers you, our design conscious customer, a new imagining of a revered classic. 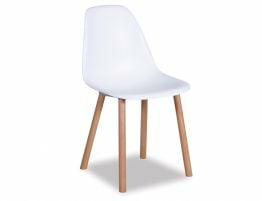 Get the retro side chair that is as unique as you are.